When you are a travel God Guru like I am, you feel a lot of pressure to give the perfect "Bon Voyage" gift to friends who are heading off to a foreign land. 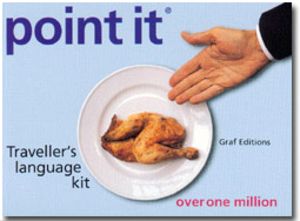 My absolutely favorite gift is a nifty little book called Point It. The book is the simplest kind of brilliance. It's a teensy paperback containing thousands of pictures of everyday things and concepts. If you find yourself abroad and stuck in a moment of language incomprehension, just whip out your little book, find the picture, and point. Honestly, it's perfect. Look at the 2-page spread below. It contains at least 50 different things you might want, solely in the breakfast category. Seriously, almost any critical item or concept can be pointed to in Point It. Pick up a copy or order online from my favorite all-purpose travel store, Flight 001. Happy pointing. It's better than Berlitz. Sure it's boring to show your family members on a blog that purports to be about a bigger, more universally appealing topic like travel. 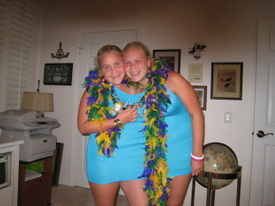 But this shot of my nieces Amanda and Ashley was too funny to pass up. I took it while visiting my family in San Diego last week. They're not twins, but in this get-up, you might think the Alport family is a bit Side Show. We are. I'm back in New York after an extended business trip to California. Here is the rundown in numbers. Great trip. And I'm glad to be home. Holy Smokes! Where Am I? I was in LA over the weekend. But I'm looking for a more specific answer for where I'm standing in this shot, taken on Saturday. If you were a TV watcher in the 60s and 70s (as I was), you'll recognize this hole immediately. 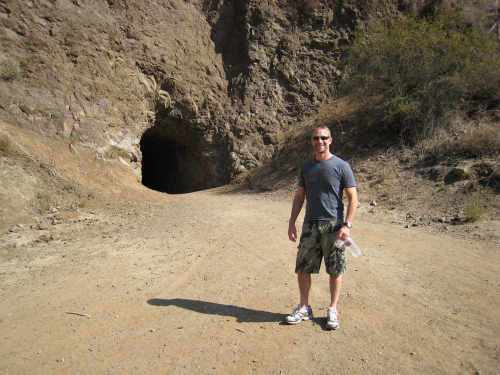 So do some internet sleuthing to determine the exact location of this shot. Jul 25, 2007 1:05:00 AM | Where Am I? Are those mausoleums in the background of my picnic with adorable Dale? Yep. 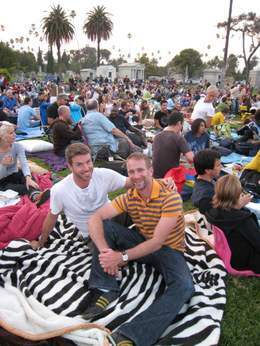 Because this weekend we went to a screening of 70's horror flick Suspiria in the Hollywood Forever cemetery. The amazing event is part of the annual Cinespia Cemetery Screening series, and if you're in LA on a Saturday night before the end of the summer, check it out. It draws the coolest crowd in town. The evening opens with a live DJ spinning as the crowd picnics. As the sun goes down, the film is shown on the side of a giant crypt. That's the kind of inventiveness that makes me love LA. 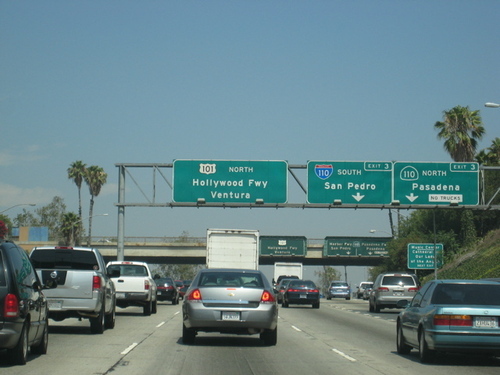 Renting a car can be one of the most frustrating parts of travel. If you get stuck waiting in line to rent or return a car, you might wonder if the Digital Revolution ever occurred. Today, I was pleasantly surprised by my car rental experience. I flew from SFO to LAX, and headed to the Alamo area by shuttle bus (never fun). 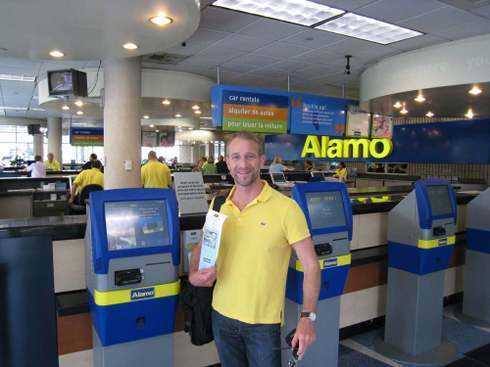 I am not an Alamo frequent renter, so I was prepared for the worst. Imagine my surprise when I came across this colorful row of kiosks. I swiped my credit card, scanned my New York State driver's license, and one minute later was off to select my car from a row of spiffy Compacts. I smiled all the way as I drove to my $130, Priceline-secured suite-with-Pacific-View at the InterContinental. Car renting has arrived. And I am a newly devoted Alamo man! To the untrained eye, this is a pumpkin patch. 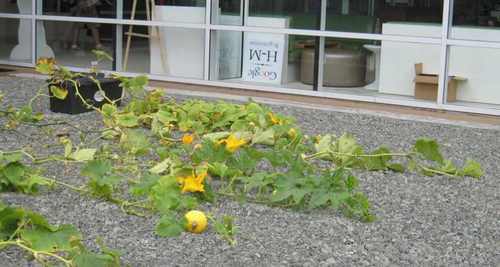 To the well-trained, high-tech, start-up entrepreneurial eye, this is a pumpkin patch outside Building 43 at Google. I have such an eye. And this is the very special pumpkin patch growing on Google's campus in Mountain View, CA. All I can say is, that's gonna be one very smart pumpkin. I arrived in San Francisco (yet again) on Sunday. The beginning of 10 days of work on the west coast. It's sort of foggy-ish and chilly-ish. Which is one of the major reasons I went screaming back to NYC after living here. That said, one of the great thing about a teensy little cow town like San Francisco is the likelihood of running into your old friends and acquaintances, with practically no effort. Makes it feel like home. So far I've seen Jeff and Randy and Gina and Scott and Steve and Larry and David and Jessie and David (a different one) and Ian and Scott (a different one) and Eric and Jeff and Dan. And it's only Tuesday. Who knows who lies ahead? 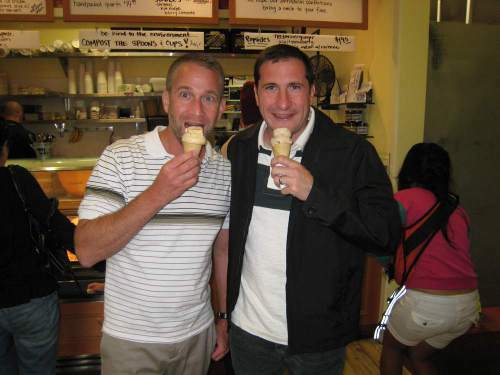 This is a picture of me and my friend Steve eating ice cream at the A-MA-ZING little Bi-Rite Creamery in the Mission District. One of the most divine cones I've licked in a long time. It's "Burnt Caramel." Next trip out, put it on your short list. This is me. On the beach. Reading a book. Nothing too shocking there. But look a little closer. I think I look kind of beefcake-y, don't you? Which makes me think I should steal my friend David Kennerley's camera, because I never look like a beefcake on the beach. Here's to David's camera skills, and to the art of the strategically placed book. 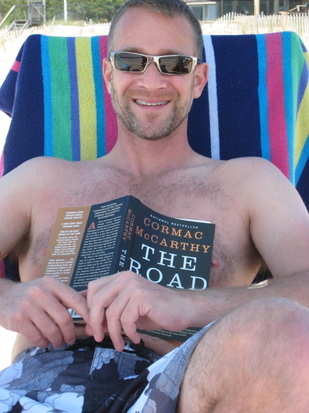 What's more wrong with this picture is the huge grin on my face as I'm reading The Road, by Cormac McCarthy. This is the opposite of a light and fluffy beach book. But it is an incredible book, and I urge you to read it, on the beach or anywhere. The Road tells the story of a father and son desperately wandering through a post-apocalyptic wasteland. The Road is devastating. But it's also deeply, beautifully human and humane. And it makes you appreciate everything you might ever take for granted in this blessed, fragile and fleeting thing we call life. Starts with a G. Ends with a Y. Today's post is a brain teaser. Well? Any idea what what word I'm thinking of? I'll bet you do. Just click here to find out. And buy a ticket fast.